Common thermocouple extension cable types are made up into standard multipair cables. Each conductor is covered with a polyvinyl jacket, nominal 0.38 mm (0.015") thick, and the pairs are individually twisted. Clear polyester film/plastic sheet tape is then wrapped around the bundle of twisted pairs. A stranded tinned-copper drain wire is laid over the bundle, which is covered with aluminum-backed polyester film/plastic sheet tape to serve as an electro-static shield. The drain wire provides a simple mechanical termination for the shield. The cable is then covered with a jacket of polyvinyl approximately 1.1 mm (0.045") thick. 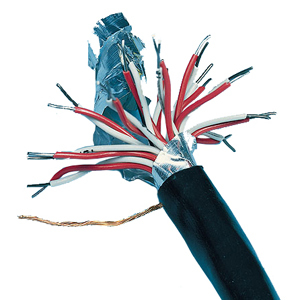 As an added convenience, each standard cable contains an extra polyvinyl-clad stranded-copper wire for use as a ground connection, or to complete a communication or signal circuit. Standard cables are color-coded. The individual pairs are marked 1-1, 2-2, etc., for easy identification. Insulation will withstand temperatures up to 105°C (221°F). Any standard item can be overbraided with tinned copper, stainless steel or Inconel upon request. Multipair extension cable can be made to order with insulation to suit your installation requirements. Consult Sales Department on pricing and quantity minimums. For Higher Temperature and More Severe Environments FEP Insulation and Individually Shielded Pairs are Available! Note: Metric dimensions are approximate.